Is Your Kid Up to Par? 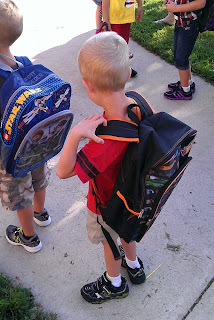 A couple weeks ago, my son started kindergarten, which is apparently a big deal. He’s been in daycare since birth, so he’s used to the whole school thing: sitting patiently, sharing, not biting, knowing colors and letters, etc. With two bookworm parents, he’s always and constantly been exposed to books and libraries. And while he can’t read much yet (mostly sight words – in, out, push, pull, tornado, Texas, lobster, guidance counselor, etc), he’s inherited the love of books. He’s also inherited my love of lists, so we were both interested to see this list at the library: 50 Books Your Child Should Read Before Kindergarten. But much to my chagrin, he’s only been read 18 of those books! I quizzed him, and his daycare teachers hadn’t read the missing ones either (as far as he was aware, so take that with a grain of salt). Upon closer examination, however, I noticed several stories missing that he had been read: Roald Dahl’s The Magic Finger. Amelia Bedelia. Winnie the Pooh. Excerpts of Tom Sawyer and The Hobbit. Poems by Shel Silverstein. You know, chapter books. Classics. And then I didn’t feel as bad, knowing that we’d been able to skip the picture books for more complex stories. If you have kids, what kind of books did you read them when they were little? Any recommendations for a five-year-old boy obsessed with weather and machinery?